When we were planning the South American leg of our trip my only request was to be in Buenos Aires for the world cup. John, being the lovely man that he is, acquiesced without too much pleading on my part (malbec, empanadas and alfajores figured quite prominently if I recall correctly) and we set about finding an apartment to rent. It wasn’t long (a google search here, a thorntree search there) before we alighted upon the website for San Telmo Loft, a quick read and we were sold and promptly sent off an email inquiring about availability. It may not have been the cheapest of apartments out there but it was certainly the most interesting in our price bracket, in a great neighbourhood and packed with great amenities. Including, yes – you’ve guessed it, free wifi. So with free and reliable wifi for the next month it would feel churlish to not at least attempt this blogging lark one more time before we throw in the towel and resign ourselves to a lifetime of blogless shame. I therefore promise you dear reader (I think we may still have one or two kind souls who haven’t thrown us off their feed), to attempt to post daily whilst we’re in Buenos Aires. As my last post was about our Californian homes and this post comes courtesy of our Buenos Aires home I shall leave you with pictures of a couple of a favourite homes of the last ten months. 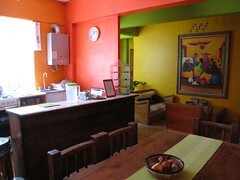 The Chillout Flat, Mexico City. 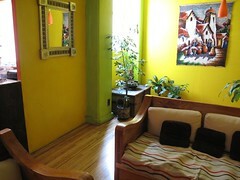 Beautiful space, fantastic hosts, great breakfasts! 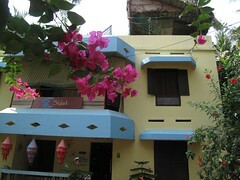 Skylark Guesthouse, Varkala. Go there, stay there, never want to leave! 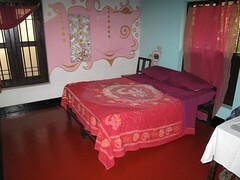 This entry was posted in Argentina and tagged Accommodation, Argentina, Buenos Aires, good intentions, India, Mexico. Bookmark the permalink. Both comments and trackbacks are currently closed. Hooray! A blog post! Glad I didn’t delete you from my Google Reader! Gosh, a month in Buenos Aires. Sounds amazing. More pictures please. And if you manage to post daily, I’ll eat my hat. If I succeed do I get to choose the hat?